This condition occurs when the muscles in an enclosed compartment swell which in turn limits the blood supply to this group of muscles. 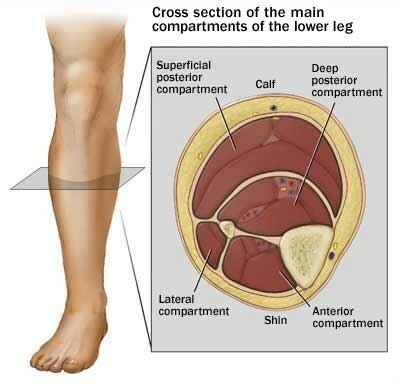 The lower leg has four separate compartments all of which can be affected. In most patients both legs will be affected. Typically patients notice a cramping type pain when they run or walk briskly. It normally occurs with the same amount of exercise every time. The symptoms only disappear when the exercise is ceased and the legs elevated. Scans and xrays can not reliably diagnose CCS. Often it is suspected on history and the diagnosis confirmed with compartment pressure testing. This testing is performed by one of the sports physicans I work closely with involves the measurement of the pressures in your legs ( with a needle ) before and after exercise. Other than avoiding the precipitating activity the only reliable way to cure CCS is decompressive surgery. It is performed under a general anaesthetic and involves one or two 7 cm incisions on each leg and then longitudinal fascial releases. Strict elevation of the legs for the first 10 days. Fully weight bearing with crutch support. Stretches begin at 2 weeks. Light physio at 2 4 weeks. Return to sport 8 12 weeks. Infection, bleeding, bruising and blood clots can occur with any lower limb surgery. Wound breakdown: can result in larger scars and require further surgery or dressings. Infection: occurs in up to 5 % . Numbness: there is always a small amount of numbness of one side of the wound. To download this information and keep it with you, the PDF is available here.